A beautifully written and fully illustrated experience of the Great War from a participant . . . Though the United States was late to enter the Great War, a number of idealistic young Americans wished to take part from the beginning. One of these was Avery Royce Wolf, a highly educated scion of a family in America’s burgeoning industrial heartland. Volunteering as an ambulance driver with the French Army in the Verdun sector, Royce sent back a constant stream of highly detailed letters describing the experience of frontline combat, not excluding comments on strategy, the country he encountered, and the Allies’ prospects for success. This treasure trove of brilliant letters, only recently discovered, is accompanied by several albums worth of rare, high-quality photos depicting aspects of the Great War in France never previously published. The book contains expert overviews to set the reader in Royce’s time and place; however, the narrative is most gripping with his own day-to-day perceptions, analytical and emotional in turn. The reader can sympathize with Royce’s dilemma when his original term of service expires and he wonders whether to return home. But then the American army begins to arrive and he decides to continue on. We hear firsthand how the U.S. troops are first kept out of battle, then take casualties no veteran unit would have sustained, because of their fresh-faced audacity. When the Ludendorff Offensive unfolds in spring 1918 there is nothing but disaster to report, as each day witnesses a new collapse before the seemingly unstoppable Germans. Royce believes that the entire Allied war effort is doomed. But then somehow the Allies hold on and the war is nearly at an end. 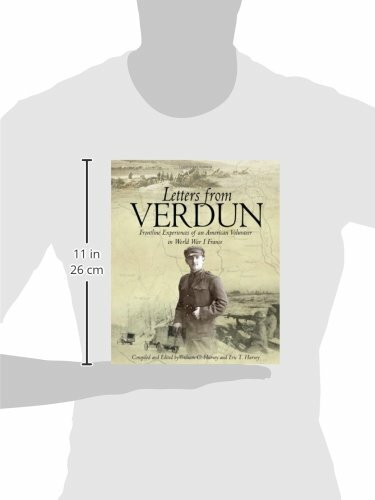 Full of exciting experiences as well as interesting firsthand analyses such as comparing French and German trench works (the latter were far better), Letters from Verdun brings the reader amazingly close to the frontlines of the Great War, almost as if in person.